Introducing your baby to solid foods is an exciting milestone your little one (and her taste buds) is sure to enjoy. When you start introducing children to the world of solid foods, you are helping them shape food and feeding habits while establishing healthy eating patterns. Not sure how to get your baby started on solid foods? These tips will help. DO check with your pediatrician before starting solid foods. Most in the medical community agree the best time to start your baby on solid foods is when she is 4 to 6 months old. Look for physical signs that your baby is ready for solids, such as sitting up with limited support, good head and neck control and keeping most of the food in her mouth and swallowing it. DON’T get caught up in comparing your baby’s progress or readiness to start solids to another baby. Not all babies reach milestones at the same time. Never force your baby to eat if she cries or turns away when you offer solids. She might not be ready to try eating from a spoon, or she might just not be hungry! Go back to nursing or bottle-feeding exclusively for a day or two before trying again. DO start with a single-grain infant cereal mixed with breast milk or formula, or a pureed fruit or vegetable. Some easily tolerated first foods are iron-fortified infant rice or oatmeal cereal, pureed avocado, banana, sweet potato, carrots, pears or peas. Mix breast milk or formula with your desired pureed food until it has a thin, liquid consistency. Gradually increase the thickness of the puree when your baby can swallow without trouble. Wait three to four days before introducing another food to your baby. If you suspect a reaction, stop feeding your baby the new food immediately and contact your pediatrician. DON’T stop breast-feeding or formula-feeding just because you’re working on the switch to solids. Breast milk or formula is still your baby’s main source of nutrition and calories. And, even if it might seem like an easy out, never add honey, salt or sugar to baby food to “entice” or “trick” your baby into liking a certain food. DO try to relax. Most of the first few solid-food feedings will wind up on your baby’s face, hands and bib. While there is no exact serving size of solid foods for babies, the general rule of thumb is to start small, giving your baby about one to two teaspoons of pureed food. Gradually increase this amount over time. DON’T feed your baby solid foods from a bottle. Always spoon-feed from a bowl, not from the jar of baby food unless she will finish it. Feeding your baby directly from the jar may introduce bacteria from your baby’s mouth to her spoon and back into the food, creating a food safety issue. If your baby is still hungry, use a clean spoon to take more food from the jar. Stop feeding your baby when she turns her head away from the spoon or keeps her mouth closed. Never force-feed a baby. Whatever happens, don’t get discouraged and do enjoy the ride. With a little patience and creativity, you can make your baby’s first solid food eating experience fun for everyone involved! Reach for produce! 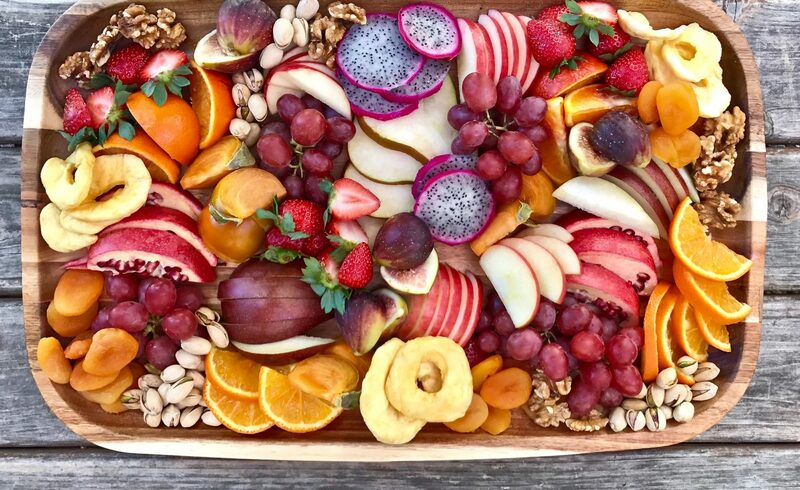 Enjoying fruits and vegetables is a delicious way to get vitamins, minerals and fiber. People who enjoy fruits and vegetables as part of an overall healthy diet may lower their risk of some chronic diseases.